Find hotel near Museum Of Cocoa And Choco ..
Gabrielle Draps, who was married to famous chocolatier Jo Draps, opened this museum in 1998. It explores the history of chocolate from the Mayans to the modern times. Exhibits take you through the process of making chocolate. There’s a small but amusing collection of chocolate themed items such as chocolate dresses, pots, cups and sculptures. Of course there is a tasting session. True chocolate lovers can even take part in chocolate and praline making workshops. Don’t have too high expectations though; the museum is the love child of an amateur. Guided Tour: EUR 60 for 1 hour in Dutch and English. EUR 75 for other languages. Combination tickets with mini-Europe available. Closed on holidays, but can be opened under special circumstances. Call the museum. How popular is Museum Of Cocoa And Chocolate? 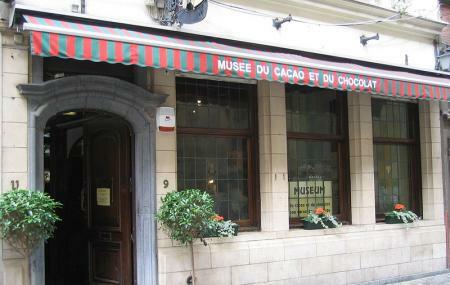 People normally club together Grand Place and Manneken Pis while planning their visit to Museum Of Cocoa And Chocolate. This museum has changes location to a few meters away. Absolutely loved this museum. It is more based on experience, rather than too much information. However, most of the information is very interesting and attractive for all ages. You can get to try different types of chocolate and also get to see a live performance of a great guy making pralines. They tasted amazing and the guy was very friendly and engaging. Highly recommend this museum. Also, quite affordable. The new place is very nice, bigger than the previous one, more interactive. You can really see all steps of the cocoa and chocolate production from the beginnings till today. Kid friendly with all the games. Also you have an audio guide avaliable in various languages. At the reception you can also buy souvenirs and chocolate. They also have demonstrations of chocolate making on the first floor or at the ground floor kitchen. There are also cabinets you can use to leave your bag and coat for the visit. Definitely recommend the place. More than the tourist trap you might suspect. The museum has a rich collection detailing the history and modern production of chocolate. There are frequent demonstrations of chocolate praline making that are good enough that I went home and made some with no experience without need of a recipe. The shop has a selection that while small is actually unique even in a city dotted with chocolate shops. I actually thought of visiting more than once. I would have if my stay had been longer. This is the place that has bunches of educational and historical things about chocolate. The museum itself is not really big but it has great atmosphere. The aroma there was nice, sweet and lovely. It was great to see how to make the chocolate shells with the models. The overall experience was amazing but the presentation was a bit short and only gained a piece of chocolate.